The crop agent met with the farmer to discuss the renewal of the upcoming crop policy. At that time, the farmer advised that he is contemplat-ing a change to organic farming and inquired as to what his guarantee would be. 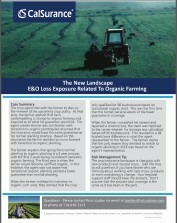 The agent admits that he was not familiar with transition to organic planting but assumed that the insurance would have the same guarantee as his normal planting practice. Based on this discussion the farmer decided to move forward with transition to organic planting. The farmer explains that going from normal planting to organic planting is a 3 year process with the first 2 years being considered transition organic farming. The third year is when the farmer would become certified organic. In this instance, the agent was not aware that transi-tional organic planting yielded a lower guarantee than normal planting. The Department of Labor’s (DOL) new Fiduciary Rule essentially broadens the deﬁnition of investment advice, making routine broker-dealer activity in connection with retirement plans subject to ﬁduciary duties. This represents a dramatic change for the broker-dealer community, which until now has relied upon certain technical regulatory exemptions to avoid being deemed a ﬁduciary when advising retirement plan clients. Broker-dealers will now have to analyze how they conduct their business, assess the costs and beneﬁts of transacting certain lines of business, as well as implement and enforce policies and procedures to ensure compliance with the law’s new and enhanced duties. Congress, state legislatures and regulators have imposed a myriad of obligations on broker-dealers and financial institutions to combat cybercrime and particularly, identity theft. Nonetheless, identity theft and cyber crime continues to plague the financial industry and consumers alike. Therefore, when Congress passed the 2010 Dodd-Frank Wall Street Reform Act, it directed the SEC to issue regulations concerning identity theft. 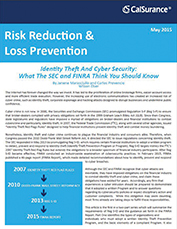 The SEC responded in May 2013 by promulgating Reg S-ID, which requires certain financial institutions to adopt a written program to detect, prevent and respond to identity theft (Identify Theft Prevention Program or Program). The SEC broadened the scope of Reg S-ID to investment advisors who have the ability to direct transfers of funds or make payments on behalf of customers because they “are susceptible to the same types of risks of fraud as other financial institutions." 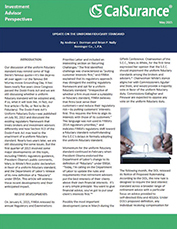 The first quarter of 2015 involved some major developments on the topic of uniform fiduciary standard, including FINRA’s regulatory guidance, President Obama’s public comments, Mary Jo White’s first public declaration in favor of a uniform fiduciary standard, and the Department of Labor’s release of its new definition of a “fiduciary” under ERISA. 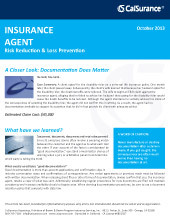 This article will address these recent developments and their anticipated impact. One development of note is the Department of Labor releasing its Notice of Proposed Rulemaking. 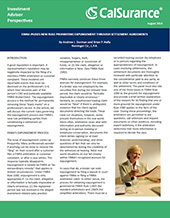 According to the DOL, the new rule is designed to require the best interest standard across a broader range of retirement advice with a particular focus on advice provided to self-directed IRAs and 401(k)s. Under DOL’s proposed definition, any individual receiving compensation for providing advice that is individualized or specifically directed to a particular plan sponsor (e.g., an employer with a retirement plan), plan participant, or IRA owner for consideration in making a retirement investment decision is a fiduciary. Interestingly, a fiduciary could be a broker, registered investment adviser, insurance agent, or other adviser. And being a fiduciary simply means that the adviser must provide impartial advice in their client’s best interest. 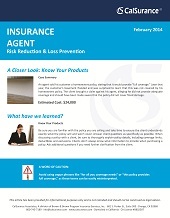 Receiving a letter from a regulatory agency or organization can make any person nervous. When this happens, people are naturally unsure what do to, why they are the subject of an investigation, and what comes next. 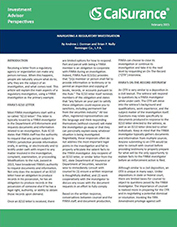 This article will explain the main aspects of a regulatory investigation, using a FINRA investigation as the primary example. Although labor and employment laws seem to be changing all the time, there are certain requirements that seem to be staying put. One of them is the Fair Labor Standards Act (“FLSA”). 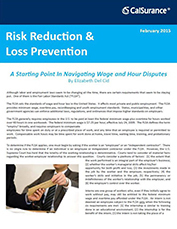 The FLSA sets the standards of wage and hour law in the United States. It affects most private and public employment. 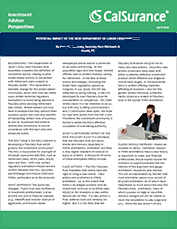 The FLSA provides minimum wage, overtime pay, recordkeeping and youth employment standards. States, municipalities, and other government agencies can enforce additional laws, regulations, and ordinances that impose higher standards on employers. A good reputation is important. 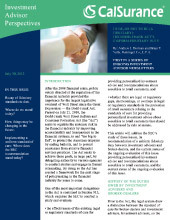 A representative’s reputation may be negatively impacted by the filing of a meritless FINRA arbitration or customer complaint. 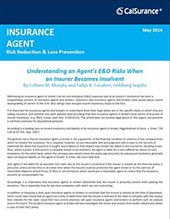 These incidents are reportable events that must be disclosed on the professional’s U-4, which then becomes part of the person’s CRD and publically available FINRA BrokerCheck. The expungement process is the method for permanently removing these “black marks” on a professional’s record. 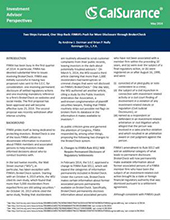 In this article, we will discuss the current rules governing the expungement process and FINRA’s new rule prohibiting parties from conditioning a settlement on expungement. It is no secret that corporate cyber security, or the protection of electronically stored private data, is increasingly becoming a topic of attention. Stories of multimillion dollar cyber security breaches such as the recent breaches at Target and eBay are becoming commonplace. 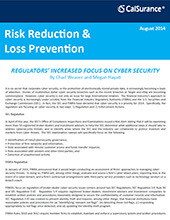 However, cyber security is not only an issue for large international retailers. The financial industry’s approach to cyber security is increasingly under scrutiny from the Financial Industry Regulatory Authority (FINRA) and the U.S. Securities and Exchange Commission (SEC). 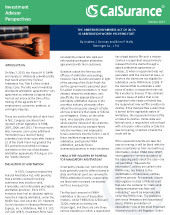 IS ARBITRATION WORTH FIGHTING FOR—PART TWO: DO STATUTES OF LIMITATIONS APPLY? By Andrew J. Dorman and Brian P. Nally Reminger Co., L.P.A. 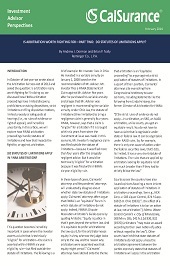 INTRODUCTION In October of last year we wrote about the Arbitration Fairness Act of 2013 and asked the question: is arbitration really worth fighting for? In doing so, we discussed how FINRA arbitration proceedings have limited discovery, prohibitions on taking depositions, strict limitations on filing dispositive motions, limited procedural safeguards at hearings (i.e., no rules of evidence or right of appeal), and incredible uncertainty. In this article, we will explore how FINRA arbitration proceedings handle statutes of limitations and how that impacts the fight for, or against, arbitration.